Oneroa Haven is a stylish, exquisitely renovated home on an elevated flat section with a guest house, plentiful gardens and sweeping views over vineyards and farms. It is ideally located close to Oneroa Village, Matiatia ferry and a short 5 min walk down a nearby bush track to the renowned Little Oneroa Beach, playground and Island coffee from the Beach Store. This idyllic property has plenty of space for extended family and friends to relax and unwind. The main house has a large, well-equipped, open-plan kitchen, living and dining area (gas oven, Bosch dishwasher, woodburner, Apple TV, wi fi) as well as a reading/games space lined with window seats. Extensive, beautifully-crafted bi-fold doors and windows run along the entire house frontage and welcome the all day sun. The house has two comfortable queen bedrooms (one with Apple TV) and a bunk room, along with a modern family bathroom. The guest house is separate to the main house and has a queen bed, window seat, bathroom and private deck – perfect for those who enjoy their own space! 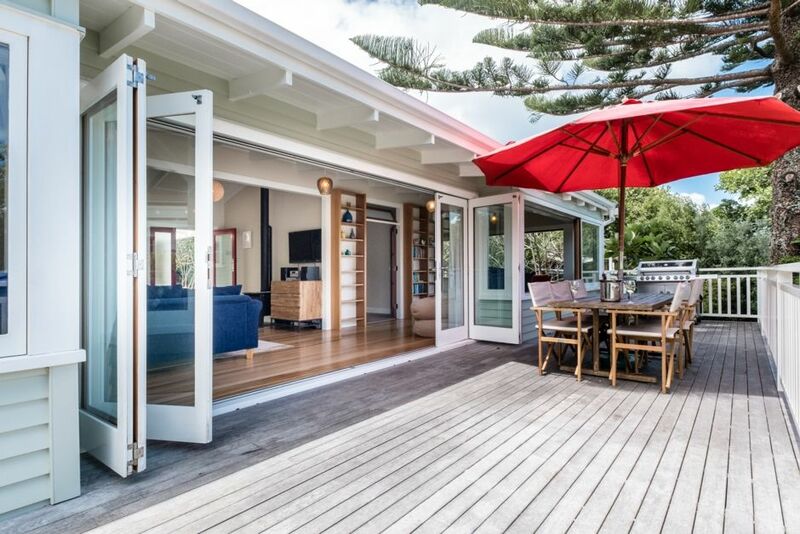 Entertain indoors or outdoors whilst watching the sun go down over the Church Bay peninsula or simply nestle into a bean bag and relax on the expansive deck as wood pigeons and tuis fly overhead. The perfect place to retreat & unwind, a fantastic family home, with a large flat lawn & plenty of space. Oneroa Haven is a stylish, exquisitely renovated home on an elevated flat section with a guest house, plentiful gardens and sweeping views over vineyards and farms. It is ideally located close to Oneroa Village, Matiatia ferry and a short 5 min walk down a nearby bush track to the renowned Little Oneroa Beach, playground and Island coffee from the Beach Store. We had such a lovely time at this property, it’s so well suited to family groups. My parents could easily escape to the sleepout which is peacefully set at the back of the property, complete with its own balcony. Meanwhile there was plenty of room for everyone to relax in their own space in the main house. Love the window seats everywhere. We easily enjoyed twice daily trips to the beach. Such a great spot, we hope to be back soon. Great comfortable property. Photos depicted exactly what it was like and we enjoyed staying there. Definitely will be back. Worked well for our family holiday. Bach was clean, spacious and had a lovely feel. Bach was clean, spacious and had a lovely feel. We could walk to Oneroa easily. The sleepout was lovely too.We would highly recommend and would happily stay again. It was a pleasure to host your group. Thanks for the feedback and we look forward to having you back to stay! Located in a quiet neighbourhood close to Little Oneroa Beach, which is a minutes drive, or 5 min walk along a coastal path. Further along is Oneroa Village with shops & cafes, which is a 15 min walk or few minutes drive. Exploring further along the coast are multiple fabulous beaches, great wineries, cafes, award winning restaurants and a golf course, all within 15 minutes drive.